The History Of Coconut Oil - Coconut Oil Works: An easier way to use the worlds #1 most beautifying ingredient for skin and hair. Possibly the first recorded coconut sighting was from Costas, an Egyptian traveler in the 5th century, A.D. He wrote about finding an “Indian nut” that many scholars today believe was the coconut. In the 9th century there are more reports of coconuts being used in China to make fibers in the market. Coconuts are talked about in the story of Sinbad the Sailor in the 1,001 Arabian Nights stories. Marco Polo referred to coconuts as “nux indica” in the year 1280. In the 1600s, the coconut was referred to as “nargils” by Sir Francis Drake. Finally in the 1700s, the Portuguese gave the coconut the name it uses today. The coconut tree provides so many different pieces to the culture and daily living in countries where coconuts are native. Through the years, cultures have used the leaves from the coconut tree to make baskets, the water and milk to drink, the meat to eat, and the shells as utensils, bowls and musical instruments. Before large factories and companies began mass producing the oils, people learned how to make the oil on their own through boiling the coconut milk. Moisturizer- Coconut oil is great for keeping skin moist and healthy. It helps to hold in moisture and smooths out cracks and rough patches. Hair Conditioner- Coconut oil can be used to repair damaged hair. It acts as a moisturizer, leaving hair silky and shiny. Kills lice- An added bonus of coconut oil is that it kills lice. Coating your head in coconut oil will suffocate the lice. 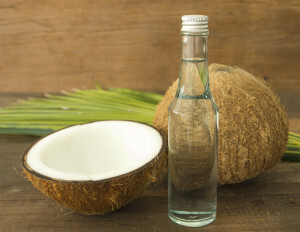 Cooking- Coconut oil has been used in cooking for centuries. There was a brief time in history when a study was produced saying that coconut oil was bad for us, but that has since been proved otherwise and now studies are showing that coconut oil as many health benefits. In the countries where coconuts are a natural staple, there is a lower rate of the diseases that plague the western world. In the United States, polyunsaturated oils like vegetable oil, cottonseed oil, and soybean oil are used at a much higher rate. These oils are less stable than coconut oil and have been known to produce free radicals. Studies show that countries that use coconut oil as a main pantry staple actually experience less heart attacks and other diseases thought to be caused by the fatty acids. The fact that people have been using coconut oil for centuries shows that there are naturally-occurring health benefits. More studies are being tested every year, and more evidence is coming in about exactly how coconut oil can be used in our modern day society. Coconut Oil Works products use organic virgin coconut oil to bring you the benefits for your skin anywhere you go.